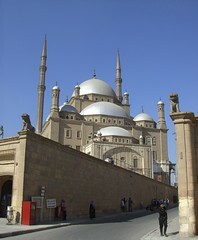 Above Cairo, within the Saladin citadel, sits the Ottoman style Muhammad ‘Ali Mosque (1848). 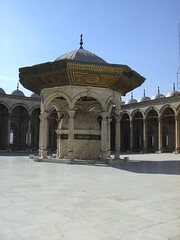 An ornate structure that provides water for washing before prayer sits in the centre of an quadrangle. 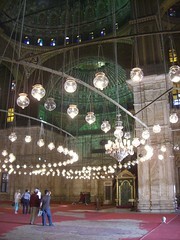 The huge prayer room is lit by hundreds of low-energy light bulbs in glass jars that may once have held candles. Tourists glide around using flash photography with blue plastic boots covering their shoes. I followed my muslim guide’s example and removed my shoes. Outside the mosque is a panorama across the city. If you listen carefully you can hear the peep-peep-peeping of the traffic below…. This scribble was published on Wednesday, December 2nd, 2009. You can follow any banter on this scribble with the RSS 2.0 feed. You can share your inspired musings after typing the anti spam word near the bottom of the page. But no Pinging because its too naughty. Shocking – filming a major religious centre and you didn’t get questioned for planning a terrorist attack… it wouldn’t happen in England!